The safety of all patrons is of foremost concern to the St. Louis Public Library (SLPL). This is particularly true of the children who make use of our facilities and services. The library staff wants the children who use our libraries to feel welcome and secure. We provide many programs and services for children that help them be successful students and independent learners. Each location has collections, computers and staff to serve children and families. Increasingly, families are beginning to rely on the library to do more than provide library services. Parents must understand that the SLPL is not able to provide babysitting services or latchkey programs for children unattended by an adult. We cannot monitor individual children to insure their personal safety. We welcome children’s use of library services, but parents need to keep in mind our purpose and services. Children should not be left unattended in any public area, including the library. Parents or guardians are responsible for the safety and behavior of their children when they use SLPL. Library staff does not provide direct supervision for individual children who visit SLPL unaccompanied by an adult. Consequently, for the protection and well being of children who use the library, we have developed the following policy. 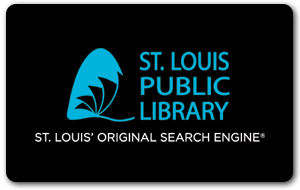 The St. Louis Public Library encourages children to use its facilities and services. The safety and behavior of the child in the library, however, lies solely with the parent or guardian or assigned chaperon of that child, and not with library staff. Teachers are responsible for the conduct of their students while they are in the library for a class visit or tour. Children must abide by the Rules Governing Patron Use of the St. Louis Public Library. Children who are disruptive and unable to abide by SLPL rules will be asked to leave library until the next business day. Unattended Child: A child under the age of twelve, who is left at the library without supervision by parent, guardian or assigned chaperon for extended periods of time, or is not picked up from the library at closing time. Chaperon: A person aged twelve or older who is responsible for the supervision of a young child who is using the library. Children who are disruptive will be warned to stop the behavior or risk being asked to leave the library. Children who continue to be upset or disruptive should be assisted in finding their parent or chaperon. Library staff should remind parent or chaperon of library rules and ask that they ensure their child obeys them. If the parent or chaperon does not supervise the child, or if the child continues to be disruptive, he or she and the child will be asked to leave the library. If the child is unattended, library staff will attempt to locate the child’s parent or guardian by phone. If located, the parent will be asked to come to the library immediately and supervise the child. If the parent is not located or cannot come to the library, the police will be called to take responsibility for the child. If the parent or guardian of an unattended child cannot be located within 15 minutes after closing time, a library staff person and security person (if on duty) should remain with the child. The staff person in charge should call 911 and tell the operator the circumstances and request a patrol car. The necessary action will be taken by the police for an abandoned child. If the police do not take charge of the juvenile, call 911 again and ask that they send the area supervisor. An incident report should be filed if 911 is called. Library staff may not, under any circumstances, physically remove the child from the building or transport the child from the library. Children between the ages of seven and sixteen who do not have an excused absence from school (including public, private or home school) during times when school is in session are considered truant. SLPL does not encourage or condone truancy, but it is the responsibility of parents and police to enforce truancy ordinances. Children who use SLPL may attend city or county schools; public or private schools or be schooled at home. Children may be suspended or have excused absence from school so it cannot be assumed that children in the library during city public school hours are truant. Children who have no visible reason to be at the library or have been at the library during school hours for several days can be suspected of truancy. The following procedures have been established for handling suspected truancy violations. Staff should try to contact the parent of an unattended child (see above). If staff is unable to contact an unattended child’s parent and the child, who is aged seven to sixteen is at the library during regular school hours and is suspected to be truant, staff should contact the police department (dial 911) and tell the operator the circumstances and request a patrol car. Staff should consult the unit manager or person in charge before calling 911. If a police officer is working at your location, he/she should assist in handling the situation. An incident report should be filed, if 911 is called. Do not call the school to report truancy or confirm the status of a suspected truant. The school will tell you to call 911. Missouri law does not mandate public library staff to report suspected child abuse. However, library staff may observe evidence of abuse, or witness actual abuse, or be told about abuse by a child who is in the library. If parent and child fight with each other or are disruptive follow procedures for disruptive behavior (see Rules Governing Patron Use of the St. Louis Public Library). After consultation with the unit manager, library staff may report suspected child abuse by calling the Missouri Department of Family Services. Police will investigate the report and during this investigation library staff may be questioned. Requests for patron records should be referred to the Executive Director. If suspected abuse is reported based on circumstances observed at SLPL, an incident report should be completed.